We're Merlin U Ward and Mimi Ortega and Wartega is our brainchild. We're a husband and wife team brewing beers with ancient ale ingredients. Ales were once brewed with all sorts of ingredients from the regions around the brewers that made them. 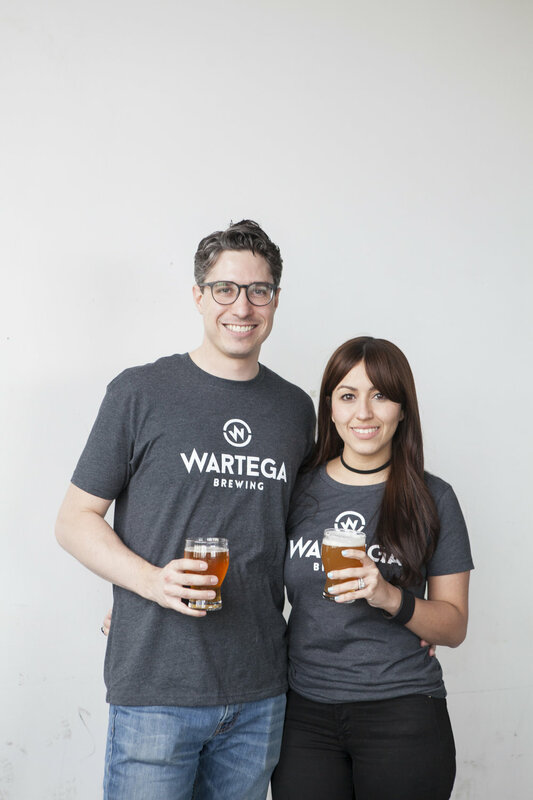 The basis for Wartega beers is combining the culinary, historical and cultural ingredients for beers with uniquely bold flavor! We hold Wartega beers to two key rules: The beer must be balanced, and the beer must be interesting. Thus, our beers are brewed with fruit, spices and herbs, while still respecting beer making fundamentals–balance and drinkability. Beers inspired by ancient ale ingredients, Carefully crafted for bold flavor. This malty ale is brewed with citrus hops and a portion of hibiscus. It exhibits a red hue a tangy finish! We wanted to create a nice, full flavor ale that was still an easy drinker. We use hibiscus similarly to how it is used in the Caribbean to make sorrel drink. It's boiled for the duration, added with the late hops, and as a dry hop. It captures the flavor, color and aroma of hibiscus. It's refreshing! Pleasantly askew. Light ale spiked with green tea leaves and nutmeg for a playfully palatable pint. The feather-light bubbles and creaminess are inclined to delight. This beer is designed for good drinking! We put a delicious twist on a cream ale, by including a hint of green tea, and a bit of nutmeg. The tea adds a subtle grassy note to the beer, while the nutmeg compliments the beer's sweetness and adds a touch of nutty flavor. This wit ale is jam packed with fruit aroma and flavor. It pears the spicy and fruity notes of Belgian yeast with kumquat and coriander. You’ll go bananas for this sub-lime brew. But don’t fall in love because you cantaloupe. Orange our puns just peachy? No jokes about it! We but a fun twist on a Belgian classic. A Belgian Witbeir is traditionally brewed with orange peel and coriander. We switched orange peel out for whole kumquats which offer a more refreshing, and zestier character. It's the perfect beer for the warmer weather. Fuss is a must! This New England style hoppy ale packs the tropical aroma of your favorite hops and is brewed with ginger. It juicy with a zip! Not that NYC needs another IPA in the mix, but we've landed on something special and uniquely Wartega. It's everything you'd expect from a New England-style hoppy ale, with mellowed edges and superb drinkability!